Is Your Garden in Danger from Gnomes? I’m taking a break from blogging to bring you an important message from the Utah State University Extension. There seems to be an annual increase in gnome numbers immediately after Christmas, so this is timely information. Growing conditions in Ogden, Utah, where this video was created, are very similar to those along Colorado’s Front Range, so I’m sure you’ll find this advice very helpful. 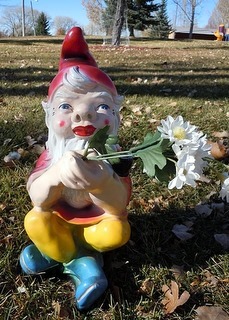 Please sit back, relax, and learn how you can deal with invasive garden gnomes! Author LAHPosted on January 31, 2013 January 23, 2013 Categories Gardening, Humor, Insects & Other CrittersTags control, garden, gnome, invasive1 Comment on Is Your Garden in Danger from Gnomes? Spring flowers are finally filling the fields. Milk vetch, penstemons, wild onions and marsh marigolds all caught my eye as I hiked though the towering cottonwoods along Fountain Creek, at the base of the Rockies here in central Colorado. I was particularly impressed by huge swaths of a foamy white flower I didn’t immediately recognize. Counting the petals—each tiny flower had four—and examining the foliage led us to conclude the plants were Crucifers, members of the mustard family. Sure enough, we were enjoying the pretty flower heads of Whitetop (Cardaria draba), an aggressive import from Europe and Asia that is listed as a noxious weed here in Colorado (List B). Oh dear. Aliens have invaded Colorado. Once again, a non-native species has moved into our territory and established a thriving population. In this case, it’s the European Paper Wasp (left). You can read all about it at the Colorado State University Extension website. In this case, having this new insect in town is a mixed blessing. Although they look a lot like a yellow-jacket, European Paper Wasps aren’t aggressive; they can sting, but they seldom do. On the down side, they’ve been known to go after the sweet juices of ripe fruit such as cherries, and pose a threat to the orchards on the Western Slope. I recently read a confounding article on Garden Rant (a gardening blog like no other). The author was reporting on some new research suggesting that not all invasive species should be eradicated. Specifically, a Penn State biologist named Tomas Carlo studied Japanese Honeysuckle (considered a noxious weed in much of the eastern US) and found that its presence increased the biodiversity of bird species as well as the number of individual birds. In fact, the fall berries are a major source of food for fruit-eating birds.